We are frequently contacted in Enable Ireland AT service by people asking us to recommend accessible phones. It might be for a grandparent or parent, someone with cognitive or access difficulties or just people who like their technology simple and functional. 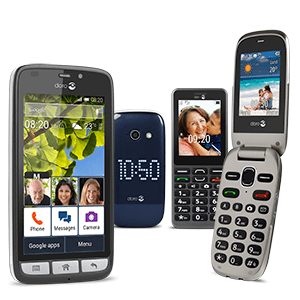 The brand we usually recommend for simple accessible phones is Doro http://www.doro.ie. They have a range of phones on their website (pictured below) mostly standard or feature phones (rather than smartphones) based on the classic clam-shell and candy bar designs. Most mobile providers (I can confirm Vodafone and 3Mobile) offer at least one Doro as a prepay option however to get access to the full range you may need to buy an unlocked sim free device from an online retailer like Amazon. The smartphone in the picture below is not listed on the Irish Doro website but can be purchased unlocked online. Another option would be to customise an Android phone. There are a range of sub €100 smartphones available from all mobile carriers and while it is a truism that you get what you pay for with smartphones the quality gap between budget and premium has never been smaller. Use Google to search for reviews and lists of the best smartphones in your price range and check spec and reviews on GSMArena for the model you are interested in (don’t get too put off by user submitted comments on this site, almost always negative). Finally and most importantly go into a bricks and mortar shop and get a hands on. Many older people (and younger people too!) have difficulty with touchscreens but to make them easier to use you can install a launcher app on Android phones. A launcher app will sit over the normal Android user interface, hiding as much of the complexity as you think appropriate. As your Granddad (or whoever the user is) gets used to the device you can give him other options like Internet or the Camera. Below are some Android launchers available on the Google Play store, many are specifically designed for older users and users with low vision. There are often free version available that are either supported by advertising or have limited functionality. It’s great to be able to test an app like this out before parting with money but be wary that those supported by advertising may lead to confusion, inappropriate content or even malware if the ad is clicked and so may not be appropriate for some users. 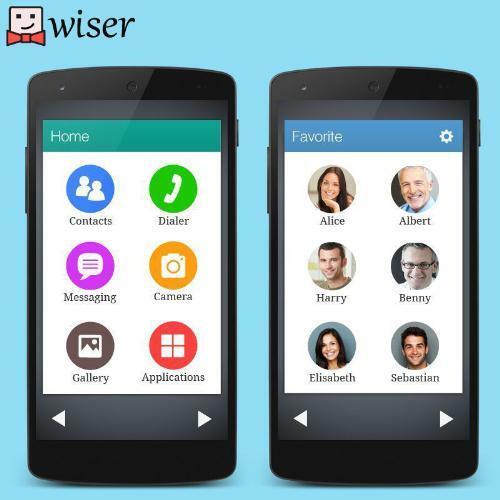 Wiser – Simple Launcher (pictured above) looks like a very nicely designed interface that is simple yet manages to avoid the fisher-price type design trap that some others fall into. 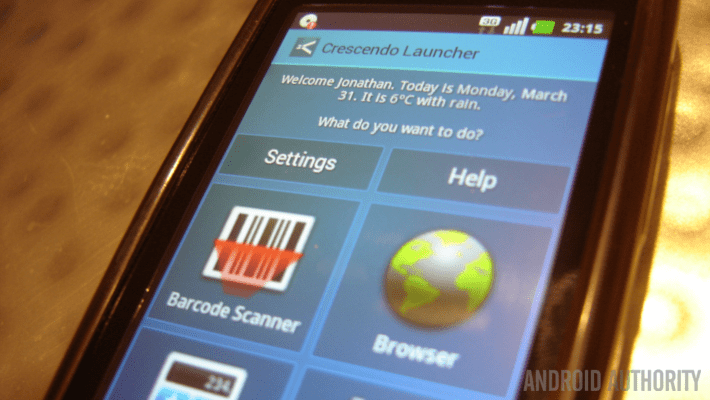 Crescendo Launcher (pictured above) is a similar idea to Wiser and offers usability combined with a nice mainstream design. Crescendo available on Google Play here: Free version is supported by advertising. Premium version also available. Big Launcher may not be a good option for the more image conscious user but it was one of the originals in this area and seems to be well supported. 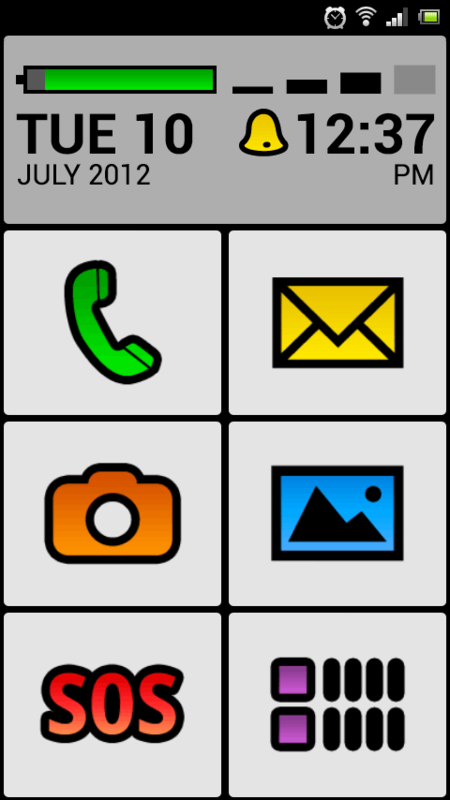 Phonotto – Is similar to Big Launcher in terms of design although in my (often misguided) opinion much nicer. 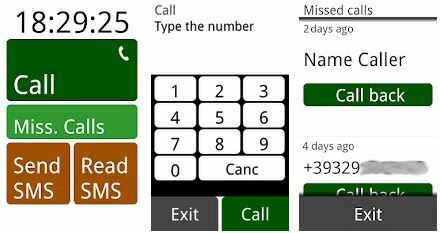 Microsoft Windows Phone offers a very user friendly and customisable home screen. The tiles of the interface can be easily removed or enlarged offering easy access to only what is required. The main reason the Windows platform is less popular on mobile devices is the lack of apps available (this is changing) but this may not be an issue for this user group. If you want to take advantage of the nice Windows UI yet still use an Android based phone you could try Launcher 8. 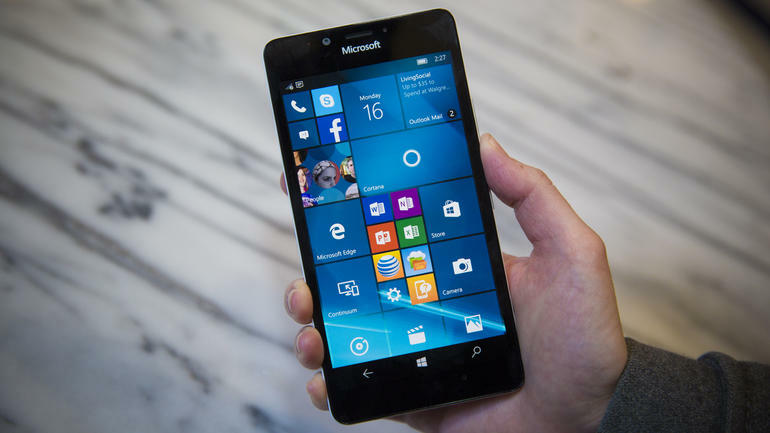 Of course you could just get the real thing and go for a Microsoft Lumia phone (pictured above). Another difficulty faced by some users of touchscreen smartphones is using the on-screen keyboard. Fortunately there are a number of Android keyboard apps that offer assistance in this regard also. If the user is a “hunt and peck” style typist Thick Buttons might work best. It enlarges the keys it thinks will most probably be used next. This makes the keyboard easier to use while at the same time offering subtle assistance to those who are unfamiliar with the QWERTY layout or with literacy difficulties. Swiftkey – Very popular keyboard with one of the most accurate word prediction systems which might make text production a bit easier. Many users who find touchscreens difficult find using a stylus helps a great deal. If you are going to try this, choose a device with a large screen like a Galaxy Note or less expensive Asus. These large phones are often referred to as… wait for it… Phablets https://en.wikipedia.org/wiki/Phablet (just to prove I didn’t make that up). Speech Recognition may not be an option for all users or it might be a bridge too far for some technophobes. If the initial fear is overcome however it is a very natural way of interacting with your device and is becoming more accurate every day. Android, iOS and Windows all offer digital personal assistants (Google Now, Siri and Cortana) that will allow you access many phone functions with voice alone. There are also apps that offer increased functionality in this area. Do a search for speech recognition on your app store of choice but stick with popular downloads and have a read through user comments before installing. This entry was posted in aids for daily living, App, Cognitive Accessibility, smartphones by Karl O'Keeffe. Bookmark the permalink.